If you’re a fan of rational, science-based medicine, here’s some good news: a family court in Florida has ruled that, all other things being equal, it’s in a child’s best interests to be in the custody of a parent who would vaccinate the child, as opposed to one who would not. If you’ve read this blog before, you probably know that, when making custody decisions, a court will base its decision entirely on what’s in the best interests of the child. Obviously, there’s a practically infinite number of factors that can be considered when making this determination. One of the big ones, however, is which parent can be expected to make sound decisions regarding the child’s physical health. You may have read that there’s a “controversy” over the use of vaccines. I put “controversy” in quotes because, in the medical community, there’s an overwhelming consensus that vaccines, in addition to being extremely safe, are highly effective at preventing numerous infectious diseases. The widespread use of vaccines is routinely cited as one of the greatest public health achievements in our time, and for most people in the developed world, potentially fatal illnesses like measles, mumps, polio, and whooping cough, are a distant memory. And thanks to the smallpox vaccine, that deadly virus has been eradicated worldwide, with the last documented case occurring in 1978. Before it was eradicated, smallpox killed several million people each year, almost entirely in the poorest countries on Earth, so eradication of smallpox has, by this point, saved millions of lives. However, over the last decade or so, there has been a movement (mostly in the developed world, where most people currently alive don’t have any direct experience with the diseases that vaccines prevent) against the vaccination of children, largely based on the notion that vaccines might cause autism. The main study that is used to back this claim up was discredited long ago, and the doctor who conducted the study has even been accused of deliberate fraud. And several subsequent studies have found absolutely no correlation between vaccines and autism. Furthermore, the chemicals used in vaccines which were claimed to cause autism were mostly phased out over the last few decades, resulting in no change to the rates of autism, strongly suggesting that there was never any causal link. Despite all this, there’s still a small but fanatical movement dedicated to the claim that vaccines are more dangerous than, say, stepping outside onto your front lawn for a few minutes (“A plane might crash on me!”). A few celebrities are dedicated to convincing the public that vaccines cause autism, and they get far more media attention than people who advocate for vaccination. 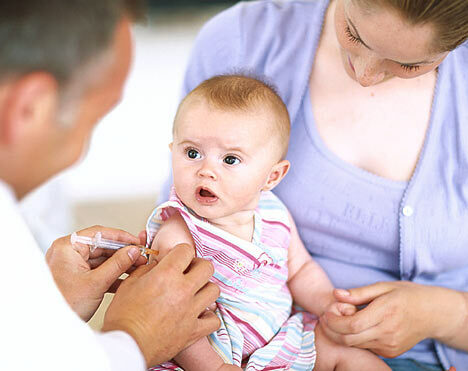 Therefore, there are a large number of parents who have decided against vaccinating their children. In some communities, this has led to outbreaks of serious illnesses like measles and whooping cough. So, it’s perfectly understandable that a court would side with a parent who would vaccinate their child, over one who would not. And I hope that other courts, when faced with this issue in the future, follow suit. Remember, when a court is making a decision about custody, its main consideration is the well-being of the child. This takes precedence over the preference or convenience of either parent. When there is overwhelming scientific evidence that one course of action is far more beneficial to a child’s physical health (a major factor in well-being) than another, the court should go with the course of action backed by the evidence. If, at some point in the future, some credible evidence emerges showing that vaccines are more risky than previously thought, it will be prudent to re-examine their costs versus benefits, which will affect future court decisions like this. Until then, however, all of the worst-case scenario “what-ifs” that are sometimes brought up about vaccines are nothing but speculation, which is definitely not the same as evidence. Or, put another way, a child is in far greater risk while being driven to the pediatrician’s office, than from the vaccine he receives while at the pediatrician’s office. That’s another good way to put it. One red herring (or is it a straw man?) raised by antivaxxers is the notion that vaccines are not 100% safe – ignoring the fact that nobody ever claimed that they are. I guess 99.9999% (give or take a few hundredths of a percent) safe isn’t good enough for them. And it also must not matter that absolutely nothing is 100% safe. A similar situation happened here in Australia just a while ago. A father took the mother of his daughter to court because she refused to vaccinate her. Oh! John Richards…you found a study that PROVES they are 99.99999% safe? WOW! PLEASE SHARE IT WITH US! That’s great news! I am certain it is a double blind, placebo controlled and no conflicts of interest involved as well! I have been taking our Aspergers kid forsocial skills instruction for more than a year now and almost nothing is apparently getting any better.. While in the groups , he could implement what they’re coaching our son. Still any time he ventures into the real world with some other boys and girls in his class, I do not observe our kid implement whatever he has been recently taught. I do think I’m just wasting our funds any time it does not make improvements to the way he really interacts with boys and girls not from his social skills training. He could also have ADHD.